Gareth has a lot of experience in building companies - he speaks about the importance of separating the pressures of work from your personal life. Yet here is a story where one really has created the freedom for the other. He also proves that putting your face and story to your business (even somewhat reluctantly) can have a great effect. People know you. Understand you. Warm to you. Trust you. (Work with you). 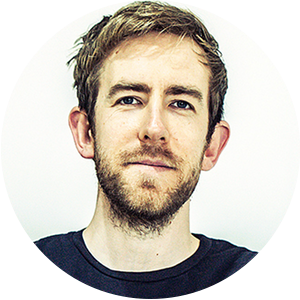 Steve Folland: Freelance Marketer, Gareth K. Thomas. Hey, Gareth. Gareth K Thomas: Hello. Hi, Steve. You okay? Steve Folland: Yeah, I'm good. Thanks for doing this. So let's get started hearin' how you got started being freelance. Gareth K Thomas: Yeah, okay. Fab. I think that the story, for me, goes way back to ... I started designing websites when I was probably about 14. I did that from my bedroom at home and that led to getting a couple of jobs off the back of that. And then, fast forward to being 21, when I started my holiday let business. Gareth K Thomas: So that was off the back of all those bits and pieces that I'd done up until that point. And I did that for 10 years. So that took us about to two years ago, and I decided I had done that for a while, the last business had taken 10 years to build from nothing into something. I wanted a change. I decided to become a foster carer. Steve Folland: Right. Just to pause slightly, so at the ago of 21 ... it's the first person I was expecting to have started a holiday let business, let's put it that way. So you were designing websites, but that was like on the side. Did you study anything to do that? Gareth K Thomas: No, I mean I think one of my frustrations with school was that ... on a long list of frustrations, one of them was that I was aware where things were at in terms of the internet and the sort of skills that you need to be able to make money online, you know doing a really good job for someone, and school would just maybe, I don't know say five years behind? Which you know in internet years may as well be 50 years behind. Gareth K Thomas: So I just drove myself. I found ... I did work experience, I was lucky enough to get in with a company that were quite small at the time but are actually quite large now, and they really helped me. Cause' they opened my eyes to what was really happening, front line at a very kind of cutting edge web development company. And that really spurred me on then. I kind of thought, "Yeah, I know what I'm doing now, this is the direction that I want to go in." I really kind of left school behind a little bit and just sort of did my own thing. You know went into school during the day, did my lessons, got my work done and then would go home and carry on with my own learnin' in the evenin'. Steve Folland: So how did you end up starting a holiday let company? Gareth K Thomas: Yeah so the reason that came about, so when I was doing the web development work I would build sites for other people, and obviously get paid at the end of it. Then in between those jobs I would either have time where I was waiting for the next client or just really a sort of a need to kind of learn something new and try out different things. So I built a few of my own sites. One of them was in the camping and caravaning industry, it was just something that we'd always done as a family. Gareth K Thomas: I worked with a few different people on that. One of them was a guy that then became my business partner at the holiday let company. The reason that we did that is that he sold his business, the caravan one, but they retained the rights to use the software, the platform that they built. They couldn't use it in the caravan and outdoor leisure industry, but it was online booking, directory, that kind of software. The holiday let industry at the time seemed primed for some change. Gareth K Thomas: They didn't have online booking, it was lots of you know, "Send me an inquiry and I'll tell you if I'm available or not," very kind of painful process for people that just really wanted to get away for a weekend. This is way before Airbnb had come on the scene. So that's how we knew each other and when he sold his business we kind of joined forces. Gareth K Thomas: I was in Uni at the time, I can almost remember I went to my lecturer, I think I'd been there about six months and I went to see him and I said "Look, I don't know what to do, I'm six months into this three year course, I don't like giving things up but I basically had an offer to start a business. There's going to be some funding involved, and I think it could be successful." To be fair to the guy, he said to me "Take it. If you want to come back to Uni in two years time if it doesn't work out, you can come back. People at the end of a degree course if they got this opportunity would be very happy with that." So yeah, good advice from him. Steve Folland: Cool. So instead your education was in actually running that ... the web side of that company, and in the business in general. Gareth K Thomas: Yeah yeah. I always say that even though I'd kind of come from a bit of a coding background and I was self taught for the most part, I'd never consider myself a coder. And I never would. Especially having worked now with lots of really good coders, I realize that I'm not cut that out for that world. But I did it out of necessity. I wanted to start a business, starting online seemed to be one of the easiest ways to do that. So it was too expensive for me to go out and ask other people to build a site for me. Doing it myself was the way forward. Steve Folland: So you did that for 10 years, and then you said you wanted to become a foster carer right? Gareth K Thomas: Yeah so it was around about, I trace it back in my mind to the Olympics, so 2012 watched the Olympics on t.v., had a couple of weeks of absolutely no work done, along with the rest of the country I think, and one of the big things that stuck out for me was the volunteers that were behind the Olympics. I think there was lots on t.v. then about how they made they Olympics what it was. Put London on the map in terms of of this is what we've got to offer. Gareth K Thomas: And I just happened to hear a radio program in the car, I think it was on radio four, and they had someone on the show from the UK Scouting Association. Saying basically that they were desperate for adult volunteers, there was a waiting list of something like 20 thousand kids just in the UK that wanted to start Scouts, that couldn't. Because there weren't enough adults volunteering their time, and a few things kind of clicked together. I went on a website, filled out my details, and I think the following evening then, I ended up helping a cub group. Which is just sort of one age bracket down from Scouts. Gareth K Thomas: I started helping there, and I've done that now for about six years. But it really kind of, it led me to the point of thinking "Right, I really enjoy this, there's something here that the rest of my life needs to involve this somehow." I didn't quite expect it to go this extreme. But yeah, it led me to the point of ... so what year would it have been? 2000 and 16 I think. I applied for adoption and I did that as a single person, so it's a little bit unusual but, they're quite sort of receptive to, you know there's not this kind of man, woman, couple is the only thing we'll accept. There's a lot of acceptance with that now. Gareth K Thomas: So I went there as a single person and I got approval for adopting two children, which is quite unusual but I had quite a bit of experience by that point of working with children. I went through the whole process, it took about a year. To the point that I was matched with two specific children and it was, everything was all planned out. Got to the point where I had decorated their room for them. I knew a bit about what they liked and what they didn't like and we were just about, I think we were about a week off arranging a meeting and just no ones' fault, just a few things started happening with their behavior and lots of ... you're constantly dealing with so many unknowns when you're dealing with children that have suffered early life trauma, as most children in care have. And yeah they just sort of made the decision then, the children would be better off staying in foster care. Just unfortunately it all happened around Christmas time as well at the end of 2000 and 16. So that was really difficult and it made me rethink the whole process. Gareth K Thomas: It also put a lot of strain on me working. Running this holiday let business and so it was time for a big rethink, and that's where I came from thinking "Actually I've done this for 10 years, the timing is right for me to take a step back from the business as other people there in place that are more than capable of taking the business onto the next chapter. And actually fostering is a better fit for me in terms of what it is that I'm looking to offer and the skill set that I have. Yeah that's how I very quickly then because I was a pre approved adopter, I very quickly then went through the fostering approval process. Steve Folland: Okay, and for those who don't know, as a foster parent do you get paid in some way? Gareth K Thomas: Yeah, so the terminology that they like to use is an allowance. It's all a bit complicated, cause' you are declared as self employed but the money you get, the allowance you get, is kind of tax free pretty much. And it depends on who you speak to then, some places will count it as a salary, some don't, and yeah there's a bit of confusion. But, essentially what they say is "We don't mind mind if you work and do other things, of if it's a two person household, one adult goes out to work and one stays home." But everything has to be ... children are the priority. These kids quite often need, oh I would say always need, a higher level of parenting than what you might class as an average. Gareth K Thomas: Just a much bigger time commitment with perhaps more health appointments than the average child. You've got contact with birth parents quite often, you need to manage that, and plus all of the kind of psychological and emotional stuff that kind of comes along with it then as well. Steve Folland: So that then becomes your job for a little while does it? In quotations marks. Gareth K Thomas: Yeah, I mean if anyone asked me what my job was, depending on who I was speaking to, in my mind I always think I'm a foster carer first and foremost. That is what I do, and then with Clarified I did the business. That's kind of ... it almost feels like my side project. It's all set up so that I can vary it. Gareth K Thomas: When things are going well with the kids and when everything's settled and we're doing fine, I can ramp up the amount of work that I'm doing. If things are difficult, so we ... the end of last term, just coming up into the summer, there were lots of things going on. Things got really challenging. So I'm able to dial back work and focus. Focus much more of my time and attention on the kids. Steve Folland: Man, good for you. So you've created a freelance business which is totally flexible around that key focus of the children. How many do you have? Gareth K Thomas: Yeah so that's the other complicated bit is that. So I obviously went through with my adoption approval for two children thinking that I would take one, possibly two. Then I'd gone, you have to go a panel and sit in front of a group of people and they make a final decision about whether they will approve you or not. And then I think something like two days later I had a phone call to say "We haven't quite approved you yet, but take it that it'll be fine, but out of interest would you consider taking three children?" And so yeah the sort of the short version of that, is that within I think three days after that phone call three kids were brought to my house. I'm very lucky because those three are still with me now and the plan for them is to sty long term, that they will stay until they leave home basically. Gareth K Thomas: Very kind of time consuming' and exhausting' and a tough challenge. Steve Folland: How old are they? Out of interest. Gareth K Thomas: At the moment now, the youngest is five, middle one is nine, and the eldest is 11. So he's just started high school. So that's kind of another big change. Steve Folland: You mentioned Clarified. So Clarified Agency is your freelance business right? Yeah so you sit there presumably thinking "Right, so what can I do on the side to keep my business brain tickin' over, and also bring in some extra income?" Gareth K Thomas: Definitely. I think extra income is always welcome in any household. I really honestly thought in particular it was a tough 10 years. We had good years and bad years, but the 10 years with the holiday let business really was exhausting. When I finished there, I kind of thought I might put my lap top away for you six months, and I'm happy to never receive another email in my life, and I was really surprised, very soon. I think what I didn't expect is that actually work for me offers quite a good creative outlet, something that I really do enjoy. What's been great with Clarified is that I've been able to very much kind of cherry pick the exact things that I like from everything that I've done before, and just do those things. Anything that I didn't like doing, I can either outsource or just not offer that, and not go into that world. 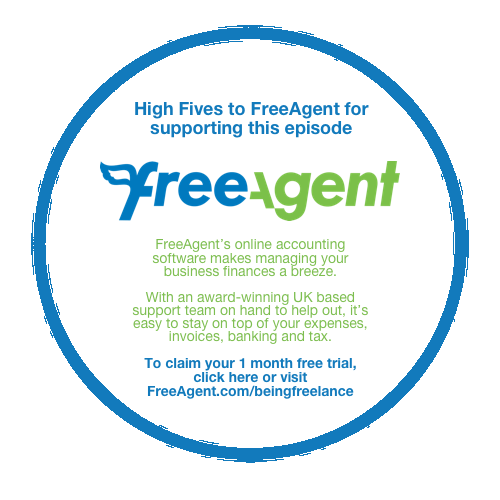 Steve Folland: So how did you start finding your first clients basically? So Clarified is a marketing agency for freelancers and consultants. One person businesses, that kind of thing right? Gareth K Thomas: Yeah, I love the term "One person businesses." Because from people that I've spoken to, you've got some people are freelancers, some people are consultants. There may not be externally a difference in the way you view them, but to them what they refer to themselves as, is important. I think freelancers, freedom, that kind of link is quite important. Consultants often feel that they're charging for their time, they value their own time. So yeah, I go for one person businesses because to me it confirms that this is a business. Whatever you call yourself is a business. Whether you're part time, full time, whatever. I think that this whole are of one person business is, I think that's just going to explode over the next few years. It already is, but I think, I don't even think we've seen the tip of the iceberg in terms of what's going to happen there. Gareth K Thomas: So that's where the idea for Clarified came about. Really my big push with Clarified is that I can see that one person businesses struggle with so many things. Marketing and branding and getting a website launched and maintained and everything, those are quite simple fixes. It doesn't need to be really complex, and I want to kind of come in what that very quick fix. Let's get something right so that you can get on with running your business. Let's not worry. Let's not get dragged down by difficulties of web hosting, packages, and all this kind of stuff. Let's just get something live so that you can get on with doing your job. Steve Folland: And what made you decide to call yourself an agency? If you see what I mean, as a one person business yourself? Gareth K Thomas: I think it links into that one person business concept. I don't like marketing myself just on my own name, and the reason ... and I encourage others to do this as well, that having started a few different businesses, they can be so emotionally draining. It's so important to have that separation from this is my business, and this is me. I think by calling the business ... If I called my business Gareth K Thomas Consulting, if things weren't' going well with he business, you can quite clearly see how the lines get blurred there. So I'm very professional with Clarified, to me it is an agency. I have an office. There is that very sort of definite separation. Yet, I think having it referred to as an agency just emphasizes that really. Steve Folland: So you mean you mention having an office there. So you're managing to to keep work and family life very separate? Gareth K Thomas: I do. I think I'm happy for them to overlap, but so long as it's me that decided that they overlap. I think so long as you're in control and you use that to your advantage, then everything's fine. It's when you kind of feel a little bit out of control that two worlds have co lidded and perhaps work is talking over your home life. I think that's when it starts to get dangerous really. Steve Folland: What sort of office space are you in? Is it like a co-work space or a permanent on your own thing? Gareth K Thomas: So I'm based at a place called Welsh Ice, and it's a mix of co-working and private offices. I've actually got a bit of a luxury up there, I've got a private office at the moment. The reason for that is that I'm very easily distracted, so I love working in co-working spaces but I don't really ... I forget about that actual work part of being there. And I also feel quite guilty for distracting other people, and end up in lots of different conversations and distractions. So I need to be in a room, ideally on my own. Lock the door and that's the only way I'm able to get work done. Steve Folland: Given who you're targeting client wise, has being there been a place to find clients? Gareth K Thomas: Yeah, I'm still in the early days of finding clients. I've been on a bit of a journey this last year in terms of figuring it out, what it is that I actually want to do, and who I want to work with. Definitely if you're in a co-working environment and you're going to the events and speaking to people and there's ... depending on the co-working space. ICE is definitely, the refer to themselves as a community. That's absolutely true. Gareth K Thomas: The difficulty I've got is that I'm really limited on time and evenings and weekends are pretty much a no go. It have very extenuating circumstances for me to arrange child care for three children, have someone that can take them to all of their clubs and after school activities and everything, for me to be able to go to a work event. So, I don't think I get the full advantage of being there, but I've also got quite a good personal network so I don't really need to tap into that too much. But yeah, I certainly recommend it as a great way of networking. Steve Folland: And you mentioned wanting to build a business which you could sort of scale or flex. So that basically the foster caring was still the focus. How have you managed that? Gareth K Thomas: I think I've managed it really well. Certainly at times I've felt like a failure because it meant not working. It meant just being a foster carer, and it's difficult because you kind of build self identity. For me I've spent since I was 14, I've always had some sort of business either paying my bills or something on the back burner while I worked a full time job, or was in school or something. To not have paying clients, and have that kind of thing going on, I found that really difficult. Having said that, looking back now, that's exactly how I designed it to work. That's exactly the way that I wanted it to be. Gareth K Thomas: The guilt of not officially working, I can deal with that. But the guilt of not prioritizing the children when they needed me most, that's not acceptable. I would lose sleep over that, it would cause long lasting damage to them, and so you know it really does work to the point where I just have to stop working sometimes. Steve Folland: Mm-hmm (affirmative). And so does that mean managing how many clients you have? Like how much stuff you take on or their expectations? Gareth K Thomas: Yeah definitely. I'm very open and honest with people. My website doesn't have too much in the way of content. It's sort of, clarified, obviously. I'm kind of honest about my story and my situation and I think most people respond really well to that openness. But also in terms of the way I've designed Clarified, I don't really do any retainer work or if there's ongoing work, I do it in chunks. So if anyone reached a point where they needed work done immediately I'd be saying to them "Look, I'm probably not the person to do that for you." I know where I am over the next couple of weeks, I know whether I can take work on or not but I wouldn't take on a 12 month project and I wouldn't take on a rolling contract or anything like that. It loses me money in the short term, but in the long term it means that my reputation remains in tact and I build clients that trust me. Steve Folland: So when it comes to school holidays, it's like "That's it I'm outta here." Gareth K Thomas: I dial completely yeah. We're just sort of getting back to the swing of things now after the six weeks summer holidays. Certainly have no paid work booked in for that period of time. I still worked. I still did bits and pieces, but it was work that didn't matter if I didn't do it. It was a bonus if I did, and it was lots of stuff that I really wanted to get 'round to. Things that were kind of, definitely in the gray area between work ... I had a book that I was reading for a friend that had launched, and a few different bits and pieces like that. So yeah, I definitely plan it. The school holidays, that's blocked out on my calendar. Steve Folland: You spent a long time working within that one particular business. What did you learn from that the helps you now that you work for yourself? Gareth K Thomas: I think the biggest thing that I learned, if I didn't already know it, was that it's tough. A business can build you up and knock you down ten times over in the space of a morning. I can definitely think of mornings where I'd open my laptop, read a few emails, feel a complete rock bottom. We'd lost a client, someone wasn't happy with something, a member of staff was unhappy. All these different issues. Gareth K Thomas: Then I'd get a phone call that would be amazing news, and then you'd be back up on a high. And then you'd have to sort one of the problems out, and you'd be back down. You literally ride in this roller coaster and it's difficult because I think when you were in sort of a normal job and working for someone else, you're relatively sheltered from a lot of the ups and downs. Whereas when you're running your own business, everything hits you. All the really positive stuff, all the really negative stuff. It all comes your way and the buck stops with you. So, it certainly built up my resilience, but it was also, it was really tough and I would kind of emphasize that to anyone that was thinkin' of starting a business. Steve Folland: Yeah. How did you find a way to sort of deal with that? Gareth K Thomas: SO I went thought the mill a little bit. What happened initially was that I really threw myself into the business and that was my, that was everything to me. Really didn't see friends much, saw family still but not as much as I should have. And then I ended up movin' from ... I'm based in Cardiff but I moved up to Edinburgh with the business. We had two offices, we merged things into one office and when things moved up to Edinburgh I moved there with the business. At that point I was there for a year, living there full time. It made me realize how much I needed my friends and my family. Having that real separation from them really made me think, "Actually I need to shift my priorities here," and that really helped. Because then things started to become a little bit more in balance. Gareth K Thomas: If I had a bad day at work, I could still go and be around my friends and around my family. I mean it sounds like an obvious thing when you think back or when you're sort of taking a few steps back. But when you're in it, you very quickly just sort of think the only way to get out of these problems is to work more. To work harder, to answer more emails, to please more clients, and actually that's quite short sighted. That's certainly not going to work in the long run. Steve Folland: Mm-hmm (affirmative). Obviously from your work wit the Cubs and the Scouts and the foster caring, it sounds like you're great at helping build people up and mentoring them in some ort of way. Is anybody doing that for you? Gareth K Thomas: Yes, so I've got a business coach. Debbie, and she is amazing. That's quite a new thing actually, but it certainly helped me because obviously in my last business I had a business partner and we certainly has some amazing clients. Some really lovely people that you'd chat to most weeks, and very supportive, loved what we were doing for them, really clients that you work with rather than work for. Gareth K Thomas: But when you're ... as I said I'm specifically looking to do a job for a client, and then I might not work with that person again. So you don't build up that ongoing relationship with every client, and I don't he a business partner now, so I don't have someone to kind of bounce ideas off. Or if something goes wrong, someone to say "Actually, you know this is a blip, but don't worry everything's going to be okay." Gareth K Thomas: So a business coach has been massively important to me and I highly recommend that to other one person businesses in particular. And yet that's really where I get most of my support from. Steve Folland: How did you find her? I'm intrigued as to how you know when a business coach is going to be right for you? Gareth K Thomas: Yeah definitely. I mean the co-=working space, so Welsh ICE, we have an internal Facebook group. It's closed off, only for people that are based there, and it's great cause' you can ask a question, feel no sense of "Am I being judged here?" Cause' nine times out of 10 someone within the community has been through that themselves. Gareth K Thomas: Someone that I knew there jumped on a thread. I don't think I posted something, I think I'd seen something, and I jumped on that and then they dropped me a message and said "Oh, if you're looking for a business coach you need to speak to this lady, I think you'll get on really well with her." And that's how we sort of met up initially. Steve Folland: That's cool. You mentioned earlier about trying to figure out as you set about setting up your own freelance business, what services you would offer, how did you go about figuring it out and refining it? Gareth K Thomas: It's tricky because when I've started businesses before, it's almost always been about what is it that people need? What's the problem that needs solving? Where's the pain point? With reserve, even just with the holiday let business, we really kind of went through three different phases. It's been pretty much three completely different businesses. All based on the fact that we launched to solve one problem, realize later on actually, there's a bigger issue that needs to be solved here so lets go and fix that problem. Obviously the money follows, and keep doing that. Gareth K Thomas: I think actually if you look at most businesses that have lasted a long enough time, they're all really good at pivoting to some extent. Whereas with this business it was much more ... working with Debbie I literally drew a list of, here's a bunch of things that I'm good at, how can I put all of those together and sell that? I was kind of less concerned about what it was that people that people will pay for because I don't need to pay other people's salaries. I don't have huge fixed costs. So it's allowed me a lot more time to experiment and to build up something that is purely based really on the stuff that I enjoy. Steve Folland: Yeah, now I always do this thing where I ask for three facts about yourself. To make two true, and one a lie and let me figure out the lie. What do you have for me? Gareth K Thomas: Yeah okay so, first one is while I was in school I got five A stars at GCSC and then I went on to do my AS's and my A levels, and I got four A's at A level. Gareth K Thomas: My second one is that I was featured in a national advertising campaign for .net magazine, and that was whilst I was a teenager. Gareth K Thomas: My third and final one is that I was the only kid on the school bus with a company mobile phone. Steve Folland: I don't know why that tickles me quite so much. Okay, company for ... given your industrious entrepreneurial start in life when you were like 14, 15 so and you did A level, so that would take into like 17, 18. I'm gonna say company mobile phone is true. So, national ad campaign as a teenager for .net magazine. See that's possible. Steve Folland: 5 A stars, do you know what? I'm not going to be happy if it turns out, "No I only got four A stars," it better not be that kinda lie. I mean you went onto Uni so you must of done well. You almost sounded earlier like you were more fussed with real life learning, than school learning so, now okay I'm gonna say I don't know, maybe you totally flunked and you didn't get anything. But I'm gonna say the GCSC, all the A stars, that one, that's the lie. Gareth K Thomas: You're right. Yeah. Gareth K Thomas: And no, it's not even a little bit close. I pretty much completely failed everything that I did in school. Steve Folland: See, I picked up on that earlier. Actually it was more everything else that you were learning from. Gareth K Thomas: I really got disillusioned with school and it's tricky for me because now, you especially trying to support the kids and get them to to do well in school. And I really appreciate what a fantastic education we get for free in this country, and I feel quite guilty actually looking back that I didn't make the most of that while I was there. I took it for advantage, and I really didn't make the most of it. Gareth K Thomas: But at the same time, school kinda failed me a little bit. I'd had lots of things that I was interested in and I really enjoyed learning it and I think the way schools are set up, they almost beat any pleasure of learning straight out of you. By the time you leave, most people don't want to continue learning. They're doing to get a job or to go to Uni, or whatever it is. But it's not driven by that passion, and that's something that I want to work on in the next few years with people, definitely. Steve Folland: To keep learning yourself. Gareth K Thomas: Yeah and to bring ... there's a need in schools that at the moment everything is focused on. Get good grades, pass your exams, that's good for the school, that's good for you. Go to Uni, that kind of thing. It's still like that now, and it shouldn't be. There are other things that people can do. Myself, I would feel like I'm representing the corner of starting a business, working for yourself. Gareth K Thomas: But you know there are plenty of other options as well, and that's something that I'm really passionate about, and it's definitely something I'd like to do more on. Steve Folland: Mm-hmm (affirmative). Now, if you could tell your younger self one thing about being freelance, or being in business, what would that be? Gareth K Thomas: I think the biggest thing, it sounds obvious, but that it's possible. I think whilst you're in this eco system, whilst your in this little bubble of school, your path seems quite clearly set out, and actually the idea that you could just start a business, even while you're in school and make real money, I think that still seems a little bit alien to people. Gareth K Thomas: I think a lot of people don't really believe that its possible. Even as adults you know, there are lots of people that really struggle with, "When I'm in a job I'm kinda stuck here, I don't know what to do, I've always had this idea of something that I want to start." My advice is always, "Start it." If it takes off and it's busy, then if you kind of, your questions are answered. Gareth K Thomas: If it doesn't work, there's no big deal. The main thing is, it is possible to start. You can do that right now. I was lucky that I had one or two people along the way that just at the right time said to me, "Actually, you know if you want to do that, you should just go do it." And so that's what I would tell my younger self. Go do it. It's possible. Don't worry about failing, cause' if you fail, oh well, nevermind go do something else. But yeah, that would be my advice. Steve Folland: Awesome advice too. Gareth thank you so much. Go take a look at Gareth's website, if you go to Being Freelance.com, hyperlink through Clarified is the name of it and you'll see Gareth's photo on the front ... which is great photo. Obviously there's only one photo there, there's another further down I think. Actually when I asked you for a photo you sent me, there were loads to choose from. Such awesome photos to pick from as well. I really need to do that. Gareth K Thomas: Yeah yeah, so a friend of mine Alex is a photographer, he's a really good guy. I hate having photos taken of myself, but it was Debbie my business coach that really said to me "Look, you are the business, even if you want to keep that separation of calling the business an official name, you are what you're selling." And it's advice then that I give to other people to say, nobody can duplicate you. So if you build the business around your personality and the unique things that you have to offer, that makes it really hard to copy. No one will come close to what it is that your offering. Gareth K Thomas: It is actually sort of the photography and the fact that I've really included my personal story into how, you know how I got to this point. Those are the two biggest pieces of feedback that I get from people that say, "Oh you know, really loved that." Which is really nice cause' you ... you know for me, I wasn't comfortable putting myself front and center, and to have people say, "Well actually that's why I now remember you, and that's why you stand out." That's really lovely to get the feedback. Steve Folland: Yeah oh man that's great, good for you. Yeah, do take a look. Being Freelance.com link through, and also in your services of what you offer, is a one person website for example. And then for next on the menu is a one person website, brackets, plus breakfast. Gareth K Thomas: Yeah. Yeah. Breakfast included. Steve Folland: Breakfast included, I love that. So yeah go take a look. Being Freelance.com, as ever with all of your guests, doesn't matter what they did for a living, doesn't have to be what you do, please take a listen to all of them and then follow the links through at Being Freelance.com, where we also put transcriptions for all our guests. Particularly over the last couple of seasons you'll find transcriptions. Then we're trying over time to do all of the back catalog as well, so if you know somebody who perhaps can't listen or prefers to read, then please make sure that they know it's still there for them and to help spread the work. Steve Folland: But for now, Gareth thanks so much and all the best being freelance! Gareth K Thomas: Thank you Steve. Thank you very much.